Like many English villages in the past, commercial life and events centred on the village green. 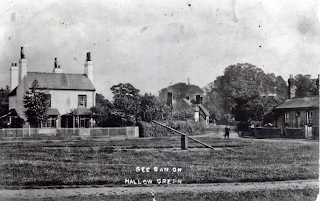 Hallow’s triangular village green lies alongside the busy A443, no longer an ideal location for village events and celebrations, now more often held on the playing field. However the May Day celebrations with maypole and Morris dancing, revived in 1950, is still held annually on the village green. CEDAR HOUSE, THE DOWER HOUSE, ELMLEY COTTAGE, LEA HOUSE AND LEA COTTAGES, THE MALTHOUSE AND BARLEY MOW COTTAGES, MARYLAND COTTAGE, THE NEW HOUSE & ROSEMEAD, THE OLD FORGE, PINCH COTTAGE, POST COTTAGE, and SPILLSBURY COTTAGE. Although now totally residential, many of the properties bordering the green hold clues to their commercial past. The Old Forge, Barley Mow Cottages, Post Cottage all hint at their histories. Old photos and documents reveal also the locations of a public house, a malthouse, a butcher, baker, tailor, petrol station and garage, a doctor and district nurse, a coffee shop and an animal pound all on and around the green. 1867: John Forty died and left the property to his wife Eliza. This could have included at least two of the Cedar Cottages from which she received rent. 1892: William Wilding (a schoolmaster) is recorded as living at Cedar House, possibly renting it? 1953: The next recorded owner, Charles Walters (Police Constable) sold the property to Mabel O’Malley for £2,300. 1962: The property was bought by John Mallalieu. 1986: sold Cedar House to the present owners. 1441 - The earliest reference to a dwelling on this site is from the Rent Rolls dated 1441 – “ A garden now a cottage.owned by John Forster. To read the research, click here. 1441 - is the first date a building is recorded on the land where Elmley House now stands. At this time it was owned by John Forster who also owned several other pieces of land. The building is described as “currently a new cottage”. To read the research, click here. 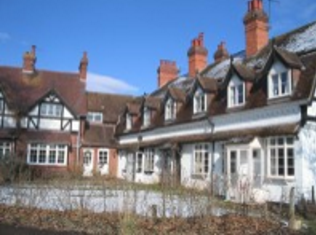 Almshouses, now row of 3 houses. Late C19. Brick, pebble dashed, tiled gambrel roof, rear roof slope at lower level, bargeboards and finial at south gable end, 4 brick chimneys flanking ridge with oversailing cap courses. Single storey and attic with dormers; dentilled eaves cornice. Each cottage 2 celled, their front elevations comprising symmetrical arrangement of one ground floor multi-paned casement, and oriel window on moulded brackets, 2 gabled dormers above with bargeboards, finials and casements and central doorway. Tiled weathering runs across all 3 elevations between floor levels and projects above doorways to form lean-to porch on timber uprights. No 1 has a glazed porch with half-glazed door; Nos 2 and 3 have C20 timber doors. The cottage at the forefront of this picture (Rose Cottage) of what is now Maryland Cottages was sold by the Executors of Mrs Emma Doughty in 1905. It was demolished in the early part of the twentieth century and the land that it occupied now forms part of the gardens of the current houses. 1840 - occupier Joseph Hughes at a rent of 2d. To read the research on THE NEW HOUSE, click here. C17 or earlier, altered C19 and extended in mid-C20. Timber-framed, painted brick infill, brick refacing, replacement walling and additions, concrete tiled roof, large external chimney stacks at gable ends. Two framed bays; single storey and attic. Framing exposed at north gable end, possibly a cruck frame, also collar and raking struts. Front elevation: irregular fenestration, 2 ground floor casements with cambered heads, C20 timber door at right end. Attic light in north gable end. Interior not inspected. A C19 single storey, single celled former dairy wing adjoins north gable end having a dentilled eaves cornice, casement to front elevation and rear outshut. Also C20 extensions to south gable end and to rear. 1335: Granted to Henry & Petronella Mareschale; cottage with a certain Smithy next to the Greeen. Henry licensed to hold a tavern. Ann Lloyd of Ludlow inherited, as a result of the death of Mary Weston, 3 cotages and gardens (1 being Pinch Cottage) rented by James Harper, Joseph Hughes and John Hooper. The annual rent was £5 each.